This review of the Hauck Batmobile Pedal Go Kart offers more than general product specifications, with design features that provide durability, playability, and safety being considered. We also touch upon product assembly and general maintenance considerations. 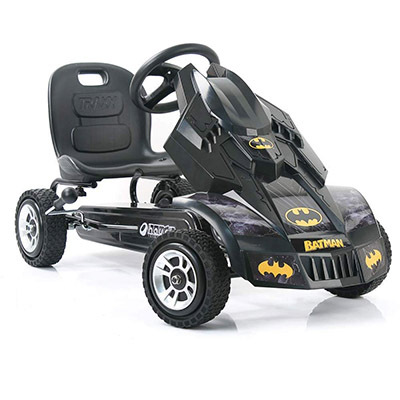 The Hauck Batmobile Pedal Go Kart offers the younger rider an opportunity to control a pedal version of the famous superhero vehicle. Towards the end, there’s a video produced by the manufacturer that covers the assembly process, for those who may be looking for a quick demonstration. The superhero theme of this go-cart has been created to imitate the look of and feel of recent Batman movies and should provide a connection that young crimefighters will appreciate. It provides a bucket style seat for the rider that can be adjusted to three positions, a feature that allows kids to continue using it as they grow bigger. A three-point steering wheel offers riders vehicle type steering while providing fast and responsive control. This go-cart uses an eight-ball type brake that mounts along the side within easy reach. Thus, it should be simple enough for the rider to engage. Each of the foot pedals complements the go-cart’s theme with a racing look and provide ample foot support for growing feet. The Hauck Batmobile Pedal Go Kart has four low profile rubber tires with tread that can provide plenty of traction on smooth surfaces. All of these features are designed to complement each other and to provide children between four and eight years of age with a pedal toy that is both fun and easy to use. Adults will appreciate the straightforward assembly of this product and should have it ready to play on within minutes of unpacking it from the box. The low-profile tires mount on wheels with a large enough diameter to provide several inches of clearance between the bottom of the cart and the ground. A reasonable seat height allows a child to operate the controls while avoiding contact with the back tires as they turn. Three sets of peg holes provide locations for the seat. These should provide a secure fit once the knobs are tightened fully. Each arm on the pedal crank is long enough to provide easy leg movement while avoiding contact with the ground on a semi-even terrain. The sprocket is bi-directional, providing both forward and backward movement as a child plays. The center of gravity remains low enough that tipping should not be a problem for the rider except at extreme hill angles. Its handbrake stops both back tires, delivering even pressure on each. Once the box is open you will want to inspect all parts for damage. The instructions should include a parts diagram that you can use to verify that all parts of the go-cart are present in the box. The German manufacturer Hauck has created a video that shows the easy assembly steps required to get the Hauck Batmobile Pedal Go Kart put together and ready for play. It was created as a visual companion to their manual. This pedal-powered toy is built for energetic and imaginative play. An adjustable seat, durable frame, and go-cart controls should assure longevity and interest. We would love to hear about your experiences with the Hauck Batmobile Pedal Go Kart, as well as advice you may have about it! I am delighted that I found this web blog, exactly the right info that I was searching for! .